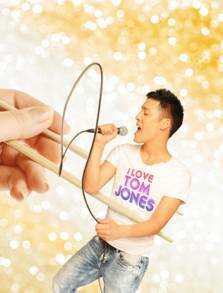 Eddie Woo is stuck working in his dad’s takeaway, having failed his A-Levels yet again, but frequently escapes to his daydreaming world where he is the New (Chinese) Tom Jones. Back in the real world though, he is juggling two girlfriends, a best friend who might be drifting away from him and a full-time job though when a talent show seems to offer a potential way out, it leads to yet more confusion as Eddie is finally forced to decide what it is he really wants from life. Such is the set up for the Theatre Royal Stratford East’s new show Takeaway, music by Leon Ko and book and lyrics by Robert Lee, which makes the claim to be the first ever British-Chinese musical. There is just so much going on in here that the overwhelming impression is that I suspect Lee and Ko might actually be certifiably insane. The manic way in which the show rockets around its different subject areas and formats is breathtaking and not always in a good way. Talent shows, racism, the pressure of working in family businesses, the Chinese immigrant experience and generation gap, frustrated youth dealing with the lack of opportunities, the questioning of sexuality and much more beside are all thrown into the melting pot alongside a structure which throws in songs in the most arbitrary of manners: as Eddie’s internal monologues, insane fantasy sequences, romantic ballads, storytelling songs, comedy numbers, Tom Jones pastiches. Everything is whirled together and so we ricochet from plot strand to plot strand with dizzying speed, resulting in a show that, however well-intentioned, ends up as something of a mess. The show works best in playing to its strengths which are the women of the cast. Gloria Onitiri and Gabby Wong are both delightfully batty and full-voiced as Eddie’s bits on the side: Onitiri’s bunny-boiler antics and Wong’s ‘Yellow Power’ activism raising chuckles. Natasha Jayetileke’s Dillon, Eddie’s best friend, is also strong and there’s excellent comedy value from Shelley Williams who rocks up in a number of small roles, grabbing huge laughs every time – her Welsh accent is really something to behold. Stephen Hoo’s Eddie is perhaps a little too reserved, not really exploding with charisma when given the chance too, and not exploiting the opportunities to progress his performance along this journey. Marcus Ellard’s Reese gets to share the loveliest song of the night with Hoo’s Eddie in ‘Come With’ (and not just because they’re singing in their boxer shorts!) which is nicely reprised with Dillon later on, but there is little real exploration of these relationships that really matter to Eddie as the revelation of the interval plays out. And this is the recurring theme, there is just so much stuffed into the show, that little is really given the opportunity to be satisfactorily resolved whether its the talent show, the father/son relationship, the presence of the character of Widow Chu, Eddie’s education, the matter of who truly wins Eddie’s heart and why: indeed the most fantastical element of the show would be how he manages to attract so many lovers. The ambition on display here at the Theatre Royal Stratford East is truly admirable, especially in giving a platform to a much-neglected voice in British theatre in that of the Anglo-Chinese. But perhaps because of the weight of expectation and the vastness of unexplored scope available, the focus has been left far too wide in trying to deal with too much in the space of the one show. Odd choices abound: for a show that claims to be about being young, British and hopelessly confused, there’s a large amount of humour that had the Chinese in the audience helpless with laughter yet sailed right over my head – injokes are fine but when used sparingly; musically there’s not enough excitement or memorable tunes; the pacing is so uneven as we move, for example, straight from fantasy number to a heartfelt father/son moment; the choice to have a finale of a song we haven’t heard before and the generally schizophrenic nature of the show and its uncertain relationship with reality makes it hard to really connect. For all that, it was actually intermittently rather fun and undoubtedly something unique, which sets it aside from many a new show which retreads old ground or repackages jukebox tunes. So go along with the thought that it is a work in progress and you might just be pleasantly surprised. One serious note though, the seats in the Dress Circle (row C at least) have absolutely no leg-room, I only have short legs myself and even I couldn’t sit facing forward, fortunately there was no-one in the seat next to me so I was able to stretch a little diagonally across the two, but had I not been able to do this, I doubt I would have lasted even the first half, so be warned.